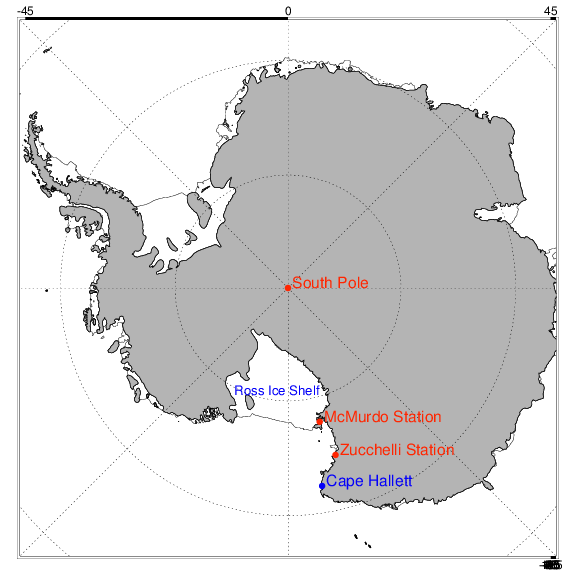 Yesterday we went to service the AWS at the remote location of Cape Hallett, which is about 800km (500miles) from McMurdo. We flew in a ski-equipped aircraft so that we could land on the sea ice and had to stop at the Italian base named "Mario Zucchelli" to refuel on the way out and back. The penguin rookery at Cape Hallett. The penguins make their nests on the slightly higher light brown regions (which do not get as wet when the snow melts). Females will not lay eggs for another 3-4 weeks. Lee Welhouse walks across jumbled sea ice towards the AWS carrying tools and spare "ECW" (Extreme Cold Weather) clothing. If not covered by snow, the sea ice is very slippery; both Lee and I took a fall en route to the AWS. The icefall on the mountain face above Lee is massive and it's difficult to appreciate its size, even when seeing it in person. Lee Welhouse servicing the AWS at Cape Hallett. We check the instruments and download all the data stored by the logger. Only some of the data from the station is able to be transmitted by satellite on a real-time basis, the rest, such as ground temperatures, has to be collected manually. I have to admit, penguins are very cute. thus energy = 12 Volts * 100 * 3600 (amp-hours, time measured in seconds) x 2 batteries = 8.64 MJ (Mega-Joules).